Looking for a fun and engaging program for your next scout meeting? Plan a visit to the Upcountry History Museum! Make the most out of your visit by scheduling a workshop with one of the museum’s talented docents. Workshops are $8 per scout and include admission to the museum, hands-on workshops related to a scout badge, and a museum patch. Scout leaders are FREE and 1 additional adult chaperone is free with every 10 scouts. Additional adults are regular admission. Art Belt Loop/Pin: Explore the foundations of art while visiting a museum. Citizenship Belt Loop/Pin: Learn what it means to be a great citizen as we explore American history. Map & Compass Belt Loop/Pin: Practice reading maps and navigating during your museum treasure hunt. Daisy Petal – Tula’s Story: Investigate what it means to be a courageous and strong woman through stories of brave women in history. Brownie Legacy – Celebrating Community: Learn what it means to be a great citizen as we explore American history. Brownie Badge – Letterboxer: Join the hunt as we explore letterboxing, a fun filled game enjoyed by people all over the world. 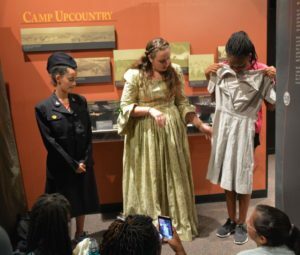 Junior Legacy – Inside Government: Dig deeper into the role of government while we learn about the women who changed the laws in our community. Junior Badge – Geocacher: Explore GPS and learn how to play the modern day treasure hunting game, geocaching. Junior Badge – Playing the Past: Travel back in time as we pretend to live in a by gone era and learn what life was like for women long ago. To reserve your scout visit email our Director of Education, Elizabeth Gunter, at elizabeth@upcountryhistory.org. Please include: your preferred workshop, date and the size of your scout group. Programs book early so please plan ahead. Have an idea for another badge that you don’t see listed? That’s okay! Email our Director of Education with your idea and we will try to make it happen. Please note: belt loops, pins and badges are not included or available at the museum. All scouts participating in a museum visit will receive a UHM patch at the end of their visit.